The Kaikoura Peninsula extends into the sea south of the town, and the resulting upwelling currents bring an abundance of marine life from the depths of the nearby Hikurangi Trench. The town owes its origin to this effect, since it developed as a centre for the whaling industry. The name ‘Kaikoura’ means ‘To eat crayfish’ (‘kai’- to eat, ‘koura’ – crayfish) and the crayfish industry is a major contributor to the economy of the region. However Kaikoura is now one of the most popular tourist destinations in all of New Zealand – and it’s whales and dolphins are the major drawcards! The Kaikoura Ranges are two parallel ranges of mountains in the northeast of the South Island of New Zealand. Formed along New Zealand’s Alpine Fault, they can be seen as the northernmost extension of the Southern Alps in the South Island. Named the Looker-on mountains by Captain James Cook, they take their name from the town of Kaikoura at the southern extreme of the more eastern range, the Seaward Kaikouras. This range rises straight from (and dominates) the coast to the north of the town, and reaches its highest point with the 2610-metre Mount Manakau. The long straight river valley of the Clarence River separate the Seaward Kaikouras from the longer and loftier Inland Kaikouras. This latter range contains the highest peak in the ranges, the 2880-metre Tapuae-o-Uenuku, the translation from the Maori of which is the poetic “Footprint of the rainbow”. Beyond the Inland Kaikouras is the valley of the Awatere River, which runs parallel to that of the Clarence. The two ranges are visible from a great distance, including from the southern coast of the North Island. The Kaikoura Peninsula is located in the northeast of New Zealand’s South Island. 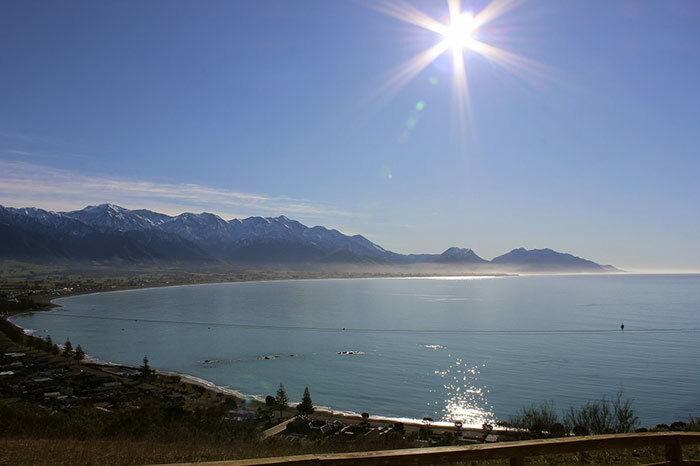 It protrudes five kilometres into the Pacific Ocean.The town of Kaikoura is located on the north shore of the peninsula. The peninsula has been inhabited by Maori for the best part of 1000 years. They used it as a base for hunting moa, and also harvested the plentiful crayfish which are found along the shore. In legend, it was from this peninsula that legendary hero Maui is reputed to have dredged up the giant fish that became the North Island. During the 19th century, European whaling stations were established in the area. In more recent times, the whales that visit the coast off the peninsula have been allowed to thrive, and whale-watching kaes the area a popular ecotourism destination. Whales frequent these coastal waters because squid and other deep-sea creatures are brought from the deep Hikurangi Trench to the surface by the combination currents and steeply sloping seafloor.